For this week’s comparison review we will be doing two back to back articles, so we surely hope you’ll like them both. 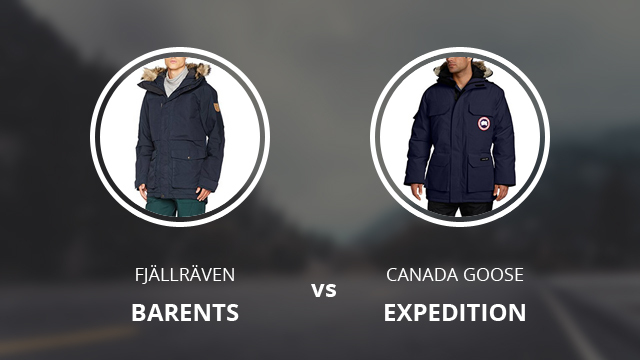 They are all parka jackets for men and in the first one we will be looking at Fjällräven’s Barents parka versus the Expedition parka by Canada Goose. As per usual, a short introduction of each brand is in order. Canada Goose is a Canadian manufacturer of luxury outdoor clothing and it is also a recurring brand in our comparison reviews. They are responsible for renowned designs such as the Expedition parka, a design that was developed in the 1980s. Since then, they have created numerous outdoor sports clothing, which are mainly aimed at those who go through very harsh winters. Another thing that bears mentioning is their work in helping to conserve the habitats of polar bears, along with Polar Bears International. Fjällräven is a Swedish brand, so we are comparing two international brands today. They are one of the most renowned companies in the outdoor gear and clothing market. They have also created their own special fabrics, which are designed to withstand different conditions and fulfill different requirements. Let’s get started with Expediton first. Style-wise, Expedition is a beautiful jacket. In a clean and very well-made design, it is a great option for men who work outdoors. The collar is hooded and lined with Coyote fur trim, which is removable. 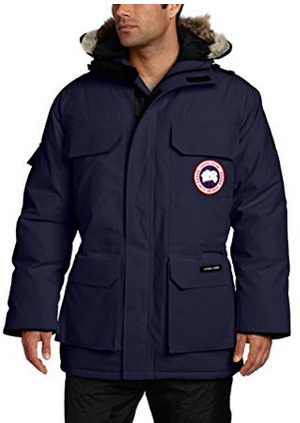 It is made of Arctic-Tech nylon, while the second lining is a combination of 85% Polyester and 15% Cotton. The insulation is provided by 625 fill power white Duck Down. There are four outer pockets on the body, all of which oversized and with flap closures. For extra room, there is also a sleeve pocket and inner ones. This jacket is adjustable at the waist with drawstrings and comes with ribbed sleeve cuffs. 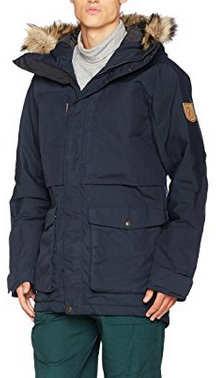 Moving on to Fjällräven’s Barents parka, also in a clean design and with numerous oversized pockets on the outside. The hood is attached, too, and comes with detachable fur trim, which is made of polyacrylic, so it is faux fur. It is a medium-length jacket that ends below the hips and has a shell made of 65% Polyester and 35% Cotton. The shell is actually a combination of G-1000 Heavy Duty and Original, the brand’s own design. This is a very durable fabric for both weather resistance and durability against environmental conditions. It is insulated with Microloft padding, which is a synthetic alternative to Down. This is a jacket that adjusts at the hood, waist and hem, for a much better fit. The sleeve cuffs are also adjustable with Velcro fasteners. Looks-wise they do not differ too much from each other, as they are both the same length, have oversized pockets on the body and come with fur trim on the hood. As for wear, Expedition is a much heavier jacket and tends to fit a bit too big, due to the relaxed fit. Barents is lighter, also due to the insulation which is very lightweight, and it also fits slightly better, if we are to judge from the online reviewers’ experience and cut of the jacket. Down is unmatchable when it comes to providing warmth, so if we are to go off solely based on that, then Expedition is warmer. However, Barents has been tried and tested in harsh temperatures and it provided and maintained warmth effortlessly. Microloft is created by Fjällräven and it performs beautifully as an insulating padding. It is super lightweight, very fluffy and does not get too affected when wet. Duck down is durable and provides great insulation, but if wet it loses quite a bit of its insulating abilities. While we settled the matter that down is indeed warmer than synthetic insulation, Microloft is a highly durable padding and it maintains its fluffiness and abilities through many washes, compressions and uses. Both of these parkas are highly weather resistant. This means that they fare well under mild wet weather, but are not completely waterproof. They are also very resistant against wind, but aren’t windproof either. Barents can actually be made waterproof by waxing it, which we have a guide on, if you are interested in learning how to do it yourself. This is another thing that sets these parkas apart from each other because Barents comes with faux fur, whereas Expedition has real coyote fur trim. Nothing compares to real fur when it comes to providing protection to the face during harsh weather, but Barents faux fur trim comes pretty close. We are looking at two high-end parkas, neither of which is cheap. They are not very different in style and fare similarly under harsh conditions, so it all comes down to whether you prefer a real down and fur jacket or one that performs closely and is synthetically insulated. I’m all for the “vegan” brand. I purchased a Goose for wife whose all about labels. A year later I purchased Fjallravens KYL parka, for half the cost of her Goose. While the build quality of the Goose is probably superior, the Fjallraven is noticeably heavier with more pockets. Never have I felt less than warm in the harshest cold in New England wearing the KYL parka. Kudos Fjallraven!! Thanks for your review John!